Final Fantasy is a series of role-playing video games developed and published by Square Enix (formerly Square). Its first game premiered in Japan in 1987, and Final Fantasy games have subsequently been localized for markets in North America, Europe and Australia, on nearly every video game console since its debut on the Nintendo Entertainment System. Final Fantasy is Square Enix's most successful franchise, having sold over 97 million units worldwide to date. In addition to traditional role-playing games, the series includes tactical role-playing games, portable games, massively multiplayer online role-playing games, and games for mobile phones. Its popularity has placed it as the sixth-best-selling video game franchise, and the series has won multiple awards over the years. In addition to the 15 games released as part of the main (numbered) series and their many spin-offs and related titles, the Final Fantasy series has spawned many works in other media including anime, movies, novels and manga, and radio dramas. Final Fantasy: Unlimited, originally a stand-alone anime series, now has its own sub-franchise which includes video games. Many games, particularly the main series, have soundtrack album releases featuring their music in different arrangements. Square Enix has also consistently released companion books for its games which provide additional backstory and plot information, as well as detailed walkthroughs for the game. Since the announcement of Compilation of Final Fantasy VII, Square Enix has focused on "polymorphic content", expanding each game world with material on many video game platforms, as well as other forms of media. Each game in the main series takes place in a different fictional universe, although beginning with Final Fantasy X-2, additional video games set in the main series games' worlds have been released. Compilation of Final Fantasy VII and Fabula Nova Crystallis Final Fantasy are cross-platform multimedia projects consisting of games, films, books, and other media centered on their respective main series game, Final Fantasy VII and Final Fantasy XIII. Final Fantasy Tactics, although originally envisioned as a spin-off game, became its own series as part of Ivalice Alliance, which counts Final Fantasy XII in its membership. A large number of spin-off video games have also been made for the Final Fantasy series. These spin-off games vary in their relation to the main series; the first, The Final Fantasy Legend games, were marketed as related in North America but were considered to be the first three games of the SaGa series in their native Japan, and later SaGa games released outside Japan bear no Final Fantasy branding. Dissidia Final Fantasy, on the other hand, is a fighting game using characters from the main series exclusively. Overall, more than 30 games have been released as spin-offs of the main Final Fantasy series, many within their own sub-series. Full 3D remake for Nintendo DS, iOS and PC. Released on PlayStation 4 and Xbox One and PC. Square's initial forays into film and television were critical and commercial failures. Final Fantasy: Legend of the Crystals was poorly received and the box office failure of Final Fantasy: The Spirits Within lead to the merger between Square and Enix. The series did not have success in film until Final Fantasy VII: Advent Children, which ultimately won several awards for "best anime feature" and sold over 2.4 million copies within a year. A director's cut version of the movie was released in 2009 on Blu-ray disc as Final Fantasy VII: Advent Children Complete. It includes On The Way To A Smile – Episode: Denzel, a traditionally animated OVA adaption of "Case of Denzel", the first story in the On the Way to a Smile short story collection. Original 5 episode animated television series by A-1 Pictures, that was released for free on the internet. Focuses on the four main characters of Final Fantasy XV - Prince Noctis, Gladiolus, Prompto and Ignis - and establishes their back story and how the latter three each met Prince Noctis. Blu-Ray version with a 6th bonus episode, focusing on Lunafreya, was included with the Ultimate Collector's Edition of Final Fantasy XV and with the Limited Edition of Kingsglaive: Final Fantasy XV. Kingsglaive is based on the setting and story of the 2016 video game Final Fantasy XV, which is thematically connected to the Fabula Nova Crystallis subseries. A prequel that focuses on Noctis' father and the Niflheim Invasion, leading directly into the events of the game. Despite its decline in the United States, radio drama has remained popular in Japan. The series features a small number of radio drama releases. The primary composer of music for the main series was Nobuo Uematsu, who single-handedly composed the soundtracks for the first nine games, as well as directed the production of many of the albums. Music for the spin-off series and main series games beginning with Final Fantasy X was created by a variety of composers including Masashi Hamauzu, Naoshi Mizuta, Hitoshi Sakimoto, and Kumi Tanioka, as well as many others. In addition to the original soundtracks, listed below, many games have inspired orchestral, vocal, or piano arrangement albums, as well as compilation albums featuring music from several Final Fantasy games. Starting with Final Fantasy III, Square began publishing guide books for its games which traditionally include additional content such as developer interviews and expanded plot and setting information. Studio BentStuff wrote the first Ultimania book for Final Fantasy VIII in 1999, though the company had been contracted to write Final Fantasy VII True Script Dissection for the previous game. Since then, Ultimania books have been written for every major Final Fantasy title, including Battle Ultimania, Scenario Ultimania, and Ultimania Omega editions for some games. Square experimented with online content delivery with Final Fantasy IX Online Ultimania, but the move was criticized for forcing customers to buy a print guide while releasing most of the information online. Another online Ultimania was planned for Final Fantasy XI, but it was dropped during development. Square Enix has produced expanded editions to some books, such as Final Fantasy VII 10th Anniversary Ultimania Revised Edition. In addition to the Ultimania series, Square Enix also publishes an Official Complete Guide series of guide books. A set of three artbooks have also been produced under the title The Sky: The Art of Final Fantasy. The set was first released in Japan in May 2002 by Digicube, then released in North America as a boxed set a decade later on October 17, 2012 by Dark Horse Books with additional postcards, prints, and booklets. A third edition was released in a slipcase by Dark Horse Books on July 17, 2013 without the additional pieces. Each book features concept art by Yoshitaka Amano, with the first book covering Final Fantasy I through III, the second IV through VI, and the third VII through X. Many Final Fantasy games have been adapted as novels and manga series. With the advent of the Internet, web novels and digital publishing have also become common. These stories act as companion pieces, offering an interpretation of the game's events or expanding the plot of the games by depicting additional scenarios. Roughly translates to "Labyrinth of Nightmare"
Roughly translates to "Eternal Legend of the Wind"
Roughly translates to "The Bonds of Two"
Roughly translates to "Beyond the Endless Sky"
Translates to "Ring of Fates 4-Panel Anthology Comic"
^ "Press Release: Square Enix Brings an Unrivaled Lineup of Franchises to E3 2010" (Press release). Square Enix. 2010-06-09. Archived from the original on 2010-06-13. Retrieved 2010-06-10. ^ a b "Final Frontiers". Edge (177). Future Publishing. July 2007. pp. 72–79. Archived from the original on 2012-05-09. Retrieved 2007-10-07. ^ a b Kohler, Chris (2004-09-24). "More Compilation of Final Fantasy VII details". GameSpot. Archived from the original on 2012-04-16. Retrieved 2006-08-10. ^ Shoemaker, Brad (2003-11-18). "Final Fantasy X-2 for PlayStation 2 Review". GameSpot. Archived from the original on 2003-12-04. Retrieved 2010-06-25. ^ Shoemaker, Brad (2006-05-06). "E3 06: Square Enix announces trio of Final Fantasy XIII games". GameSpot. Archived from the original on 2006-11-18. Retrieved 2010-10-04. ^ Mielke, James (2007-05-15). "Interviews on Final Fantasy's Nintendo DS, Wii Assault". 1UP.com. Archived from the original on 2012-08-13. Retrieved 2010-06-25. ^ Kennedy, Sam; Steinman, Gary (August 2001). "Milking The Final Fantasy Franchise". Official U.S. PlayStation Magazine (44): 99. ^ "Dissidia Final Fantasy (PSP)". GameSpy. Archived from the original on 2009-07-02. Retrieved 2010-01-27. ^ a b c "Square Enix Japan: Games 1990–1985" (in Japanese). Square Enix. Archived from the original on 2008-05-09. Retrieved 2008-01-03. ^ "Final Fantasy for NES: Summary". GameSpot. Archived from the original on 2007-06-30. Retrieved 2007-08-16. ^ a b c "Final Fantasy Origins for PS". GameSpot. Archived from the original on 2009-04-02. Retrieved 2010-06-24. ^ "Final Fantasy for MSX". GameSpot. Archived from the original on 2009-07-31. Retrieved 2010-03-29. ^ "Final Fantasy for WSC". GameSpot. Archived from the original on 2009-04-02. Retrieved 2010-03-29. 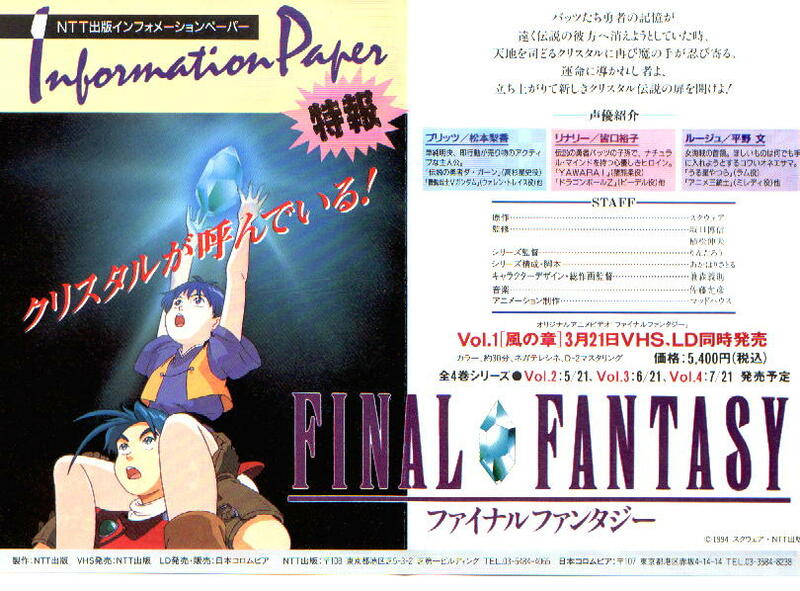 ^ "Final Fantasy for PlayStation". GameSpot. Archived from the original on 2010-01-25. Retrieved 2010-03-29. ^ a b "Final Fantasy I & II: Dawn of Souls for Game Boy Advance". GameSpot. Archived from the original on 2009-04-02. Retrieved 2010-01-27. ^ Tsukioka, Aki (2004-02-24). "Square Enix to Launch DoCoMo Sites for World-Famous Game Titles". Japan Corporate News Network. Archived from the original on 2004-04-21. Retrieved 2008-10-16. ^ "Final Fantasy Anniversary Edition for PSP". GameSpot. Archived from the original on 2011-11-26. Retrieved 2010-03-29. ^ a b c d e f Kohler, Chris (2009-03-25). "Final Fantasy Coming to Virtual Console and WiiWare". Wired. Archived from the original on 2010-07-30. Retrieved 2010-07-08. ^ "ファイナルファンタジー". PlayStation Official Site (Japan). Archived from the original on 2011-08-16. Retrieved 2011-04-04. ^ a b Nosowitz, Dan (2010-01-21). "Holy Crap, Final Fantasy Is Coming to iPhone". Gizmodo. Archived from the original on 2010-04-10. Retrieved 2010-07-08. ^ "Final Fantasy II for WSC". GameSpot. Archived from the original on 2009-10-04. Retrieved 2010-03-29. ^ "Final Fantasy II for PlayStation". GameSpot. Archived from the original on 2009-06-02. Retrieved 2010-03-29. ^ "Final Fantasy II for Cell Phones". GameSpot. Archived from the original on 2010-02-21. Retrieved 2010-03-29. ^ "Final Fantasy II Anniversary Edition for PSP". GameSpot. Archived from the original on 2009-05-25. Retrieved 2010-03-29. ^ "ファイナルファンタジーII". PlayStation Official Site (Japan). Archived from the original on 2011-10-01. Retrieved 2011-04-04. ^ a b "Final Fantasy III for DS". GameSpot. Archived from the original on 2009-01-24. Retrieved 2010-03-26. ^ "Final Fantasy III for DS". GameSpot. Archived from the original on 2010-03-03. Retrieved 2010-03-26. ^ a b c "Square Enix Japan: Games 1995–1991" (in Japanese). Square Enix. Archived from the original on 2008-05-14. Retrieved 2008-01-03. ^ "Final Fantasy II for SNES: Summary". GameSpot. Archived from the original on 2007-10-14. Retrieved 2008-01-03. ^ a b "Final Fantasy Anthology". RPGamer. Archived from the original on 2010-06-27. Retrieved 2010-07-06. ^ "Final Fantasy II for SNES". GameSpot. Archived from the original on 2007-10-14. Retrieved 2008-01-03. ^ "Final Fantasy IV for PlayStation". GameSpot. Archived from the original on 2010-03-09. Retrieved 2010-03-29. ^ "Final Fantasy IV for WSC". GameSpot. Archived from the original on 2010-04-25. Retrieved 2010-03-29. ^ "Final Fantasy IV Advance for Game Boy Advance". GameSpot. Archived from the original on 2006-02-18. Retrieved 2010-03-29. ^ "Final Fantasy IV Advance for cell phones". GameSpot. Archived from the original on 2010-08-12. Retrieved 2010-07-08. ^ "Final Fantasy IV". GameSpot. Archived from the original on 2009-05-05. Retrieved 2010-07-25. ^ "Final Fantasy Anthology". IGN. Archived from the original on 2010-12-15. Retrieved 2010-01-27. ^ "Final Fantasy V for PlayStation". GameSpot. Archived from the original on 2010-03-10. Retrieved 2010-03-26. ^ "Final Fantasy V for Game Boy Advance". GameSpot. Archived from the original on 2008-12-05. Retrieved 2010-03-26. ^ "Final Fantasy V coming to PSN". Computer and Video Games. Archived from the original on 2011-04-06. Retrieved 2011-04-04. ^ "1995–1991| Square Enix". Square Enix. Archived from the original on 2008-11-20. Retrieved 2009-08-26. ^ a b "Final Fantasy VI for PlayStation". GameSpot. Archived from the original on 2010-11-09. Retrieved 2010-03-26. ^ "Final Fantasy III for SNES". GameSpot. Archived from the original on 2011-07-19. Retrieved 2010-03-26. ^ "Final Fantasy VI for Game Boy Advance". GameSpot. Archived from the original on 2011-08-16. Retrieved 2010-03-26. ^ a b "Square Enix Japan: Games 2000–1996" (in Japanese). Square Enix. Archived from the original on 2012-03-05. Retrieved 2008-01-03. ^ Smith, Molly; Kramer, Chris (1997-02-09). "Sony Computer Entertainment America Unveils Release Date For Most Anticipated Video Game Title of 1997". Business Wire. Retrieved 2007-03-03. ^ "Final Fantasy VII for PlayStation". GameSpot. Archived from the original on 2011-07-26. Retrieved 2010-07-06. ^ "Final Fantasy VII for PC". GameSpot. Archived from the original on 2010-03-17. Retrieved 2010-03-26. ^ "Final Fantasy VII". IGN. Archived from the original on 2010-04-16. Retrieved 2010-04-09. ^ "Final Fantasy VII for PlayStation". GameSpot. Archived from the original on 2011-07-26. Retrieved 2010-03-30. ^ "Square Enix North America: Games 2000–1996". Square Enix. Archived from the original on 2012-09-25. Retrieved 2008-01-03. ^ "Final Fantasy VIII for PlayStation". GameSpot. Archived from the original on 2009-04-15. Retrieved 2010-07-06. ^ "Final Fantasy VIII for PC". GameSpot. Archived from the original on 2011-07-13. Retrieved 2010-03-26. ^ "Final Fantasy VIII". IGN. Archived from the original on 2010-04-12. Retrieved 2010-04-09. ^ a b c "Final Fantasy IX for PlayStation". GameSpot. Archived from the original on 2011-04-30. Retrieved 2010-01-27. ^ "Final Fantasy IX for PC". Steam. Archived from the original on 2016-04-08. Retrieved 2017-01-26. ^ "Final Fantasy IX". Playstation. Archived from the original on 2017-09-04. Retrieved 2017-01-26. ^ a b c "Final Fantasy X for PlayStation 2". GameSpot. Archived from the original on 2011-07-11. Retrieved 2010-01-27. ^ "Square Enix Japan: Games 2004–2001" (in Japanese). Square Enix. Archived from the original on 2008-05-14. Retrieved 2008-01-03. ^ "Square Enix North America: Games 2004–2001". Square Enix. Archived from the original on 2012-09-24. Retrieved 2008-01-03. ^ "Final Fantasy XI Online (European)". Allgame. Archived from the original on 2014-11-15. Retrieved 2010-07-06. ^ "Square Enix Announces Release Date of Final Fantasy XI Ultimate Collection". Square Enix. 2009-10-13. Archived from the original on 2009-10-16. Retrieved 2010-01-27. ^ "Square Enix Japan: Games 2007–2006" (in Japanese). Square Enix. Archived from the original on 2008-05-14. Retrieved 2008-01-03. ^ "Final Fantasy XII in stores October 31, 2006". Square Enix. 2006-06-28. Archived from the original on August 23, 2006. Retrieved 2006-08-13. ^ "Final Fantasy XII dated". Eurogamer. 2007-01-12. Archived from the original on 2009-02-01. Retrieved 2007-01-19. ^ "Final Fantasy XII International Zodiac Job System for PlayStation 2". GameSpot. Archived from the original on 2009-02-13. Retrieved 2010-03-29. ^ a b Marfuggi, Antonio (November 13, 2009). "Final Fantasy XIII – The Time Has Come". Sony Computer Entertainment. Archived from the original on May 7, 2011. Retrieved 2009-11-10. ^ SQUARE ENIX CO.; LTD. "ファイナルファンタジーXIV 公式プロモーションサイト". FINAL FANTASY XIV. Archived from the original on 2010-11-15. ^ Bailey, Kat (2010-06-30). "Final Fantasy XIV PC Release Date Confirmed, PS3 Version Delayed". 1up.com. Archived from the original on 2013-01-16. Retrieved 2011-12-06. ^ "Results Briefing Session - The Fiscal Year Ended 31 March 2010" (PDF). Square Enix Holdings. Archived (PDF) from the original on 29 September 2011. Retrieved 2010-05-18. ^ "Final Fantasy XIV dated". MCV. 2010-06-30. Archived from the original on 2010-07-03. Retrieved 2010-06-30. ^ Duffy, James (2006-08-02). "Movies that were Box-office Bombs". Boston.com. Archived from the original on 2012-10-25. Retrieved 2010-01-02. ^ Isler, Ramsey (2007-12-17). "Gaming to Anime: Final Fantasy VI". IGN. Archived from the original on 2011-08-03. Retrieved 2009-07-03. ^ Briscoe, David (2002-02-04). "'Final Fantasy' flop causes studio to fold". Chicago Sun-Times. ^ "Festival Official Presentation". Sitges Film Festival. 2005-04-10. Archived from the original on 2010-01-15. Retrieved 2010-07-26. ^ Carle, Chris (2007-02-24). "NYCC 07: American Anime Award Winners Revealed". IGN. Archived from the original on 2010-03-16. Retrieved 2010-07-26. ^ "世界中で高い評価！『FFVII AC』累計出荷数は240万枚" (in Japanese). Gpara. 2006-06-19. Archived from the original on 2013-06-01. Retrieved 2010-07-26. ^ NTT Publishing Information Paper (in Japanese). NTT Publishing. 1994. Archived from the original on 2013-11-11. ^ Legend of Crystals: Final Fantasy 1 (Dub) (VHS) (VHS video tape). Square Enix. ^ "Final Fantasy: The Spirits Within". IMDb. Archived from the original on 2009-05-05. Retrieved 2010-12-27. ^ a b "Final Fantasy: The Spirits Within". Box Office Mojo. Archived from the original on 2010-03-29. Retrieved 2010-12-27. ^ "Final Fantasy Unlimited". TV.com. Archived from the original on 2010-08-01. Retrieved 2010-07-06. ^ "Final Fantasy – Unlimited (Phase 1) (2004)". Amazon.com. Retrieved 2010-07-06. ^ "Final Fantasy Unlimited Volume 1 (DVD)". Amazon.com. Retrieved 2010-07-06. ^ a b c "Final Fantasy VII: Advent Children for PSP". GameSpot. Archived from the original on 2009-02-12. Retrieved 2010-01-27. ^ a b c Carle, Chris (2007-02-16). "Double Dip Digest: Final Fantasy VII: Advent Children (Limited Edition Collector's Set)". IGN. Archived from the original on 2012-07-07. Retrieved 2010-06-24. ^ "Advent Children Complete North American Release June". Square Enix. 2009-05-29. Archived from the original on 2012-02-21. Retrieved 2010-01-28. ^ "Final Fantasy Tactics Advance Radio Edition – Complete Version: Vol. 1". Square Enix Music Online. 2006. Archived from the original on 2007-12-23. Retrieved 2007-10-22. ^ "ファイナルファンタジー:アンリミテッド Before アウラ いのちつぐもの" (in Japanese). Seesaa. 2009-09-29. Archived from the original on 2009-10-12. Retrieved 2010-07-20. ^ "FF:U ファイナルファンタジー:アンリミテッドアフターツー -リサ たちきられたくさり-" (in Japanese). Rakuten. Archived from the original on 2011-07-23. Retrieved 2010-07-20. ^ "All Sounds of Final Fantasy I & II". MusicBrainz. Retrieved 2010-07-06. ^ "Final Fantasy III: Original Sound Version". MusicBrainz. Retrieved 2010-07-06. ^ "Final Fantasy IV: Original Sound Version". MusicBrainz. Retrieved 2010-06-24. ^ "Final Fantasy IV Official Soundtrack: Music From Final Fantasy Chronicles". RPGFan. Archived from the original on 2010-12-01. Retrieved 2010-07-08. ^ "Final Fantasy V: Original Sound Version". MusicBrainz. Retrieved 2010-07-06. ^ "Final Fantasy VI: Original Sound Version". MusicBrainz. Archived from the original on 2007-09-29. Retrieved 2010-07-06. ^ "Kefka's Domain: The complete soundtrack from the Final Fantasy III video game". RPGFan. Archived from the original on 2013-08-17. Retrieved 2010-07-08. ^ "Final Fantasy VII: Original Soundtrack". MusicBrainz. Retrieved 2010-07-06. ^ "Final Fantasy VIII: Original Soundtrack". MusicBrainz. Archived from the original on 2007-10-14. Retrieved 2010-06-24. ^ "Final Fantasy VIII Music Collection". RPGFan. Archived from the original on 2013-08-17. Retrieved 2010-07-08. ^ "Final Fantasy IX: Original Soundtrack". MusicBrainz. Retrieved 2010-07-06. ^ "Final Fantasy X: Original Soundtrack". MusicBrainz. Retrieved 2010-07-06. ^ "Final Fantasy XI: Original Soundtrack". MusicBrainz. Retrieved 2010-07-06. ^ "Final Fantasy XII: Original Soundtrack". MusicBrainz. Retrieved 2010-07-06. ^ "Final Fantasy XIII: Original Soundtrack". MusicBrainz. Retrieved 2010-07-06. ^ "Final Fantasy X Ultimania Guide". IGN. 2001-08-20. Archived from the original on 2011-08-06. Retrieved 2010-06-25. ^ "The 25 Dumbest Moments in Gaming – Readers' Top 5". GameSpy. 2003-06-14. Archived from the original on 2004-07-04. Retrieved 2010-06-25. ^ "Final Fantasy XI Playtest". IGN. 2002-04-05. Archived from the original on 2011-07-13. Retrieved 2010-06-25. ^ "Final Fantasy VII Ultimania Book Getting Revision". Kotaku. 2009-04-01. Archived from the original on 2011-03-03. Retrieved 2010-06-25. ^ "Square Enix Game Books Online | ファイナルファンタジーシリーズ" (in Japanese). Square Enix. Archived from the original on 2010-07-01. Retrieved 2010-07-19. ^ "The Sky: The Art of Final Fantasy Boxed Set :: Profile :: Dark Horse Comics". Archived from the original on May 30, 2013. Retrieved August 8, 2013. ^ Kohler, Chris (March 5, 2013). "The Breathtaking Final Fantasy Art of Yoshitaka Amano". Wired. Condé Nast. Archived from the original on August 11, 2013. Retrieved August 8, 2013. ^ "Amano Yoshitaka "The Sky" Final Fantasy Illustrations by DigiCube". Archived from the original on March 4, 2016. Retrieved August 8, 2013. ^ ファイナルファンタジー2 夢魔の迷宮 (in Japanese). Yahoo!. Archived from the original on 2011-08-03. Retrieved 2010-07-26. ^ 悠久の風伝説 ファイナルファンタジー3より 3 (in Japanese). Yahoo!. Archived from the original on 2011-08-03. Retrieved 2007-08-18. ^ Final Fantasy: The Spirits Within (Mass Market Paperback). Amazon.com. ISBN 0743424190. ^ ファイナルファンタジー:アンリミテッド―双の絆 (in Japanese). Amazon.com. ISBN 9784044277017. ^ ファイナルファンタジー:アンリミテッドアフター~外界の章~ (in Japanese). Amazon.com. ISBN 4887870353. ^ ファイナルファンタジー11―星の誓い (文庫) (in Japanese). Amazon.com. ISBN 4757714246. ^ ファイナルファンタジー11 星の誓い (in Japanese). Yahoo!. Archived from the original on 2011-08-03. Retrieved 2007-08-18. ^ Final Fantasy XI: Das Lied des Sturms, Bd 1 (in German). Amazon.com. ISBN 3833214554. ^ Final Fantasy XI on line, Tome 1 : Le Chant de la tempête (in French). Amazon.com. ISBN 2265085596. ^ "FF Crystal Chronicles Goes Comic". IGN. December 18, 2003. Archived from the original on August 3, 2011. Retrieved 2007-01-20. ^ Final fantasy VII advent children prologue (Shueisha V-Jump) (単行本) (in Japanese). Amazon.com. ISBN 4087793397. ^ "On the Way to a Smile　Final Fantasy Ⅶ" (in Japanese). Square Enix. Archived from the original on 2012-10-11. Retrieved 2010-07-19. ^ "ガンガンコミックスOnline 一覧" (in Japanese). Square Enix. Archived from the original on 2010-08-25. Retrieved 2010-07-19. ^ "Final Fantasy XI Newsletter Issue 18". PlayOnline. 2007-03-08. Archived from the original on 2009-06-29. Retrieved 2009-08-27. ^ ファイナルファンタジー・クリスタルクロニクル リング・オブ・フェイト 4コマアンソロジーコミック (in Japanese). Amazon.com. ISBN 4757741030. ^ 小説 ファイナルファンタジーIV 上 (Game Novels) (新書) (in Japanese). Amazon.com. ISBN 4757524587. ^ "Square Enix Game Books Online" (in Japanese). Square Enix. Archived from the original on 2012-10-11. Retrieved 2010-07-08. ^ Neal (2009-09-28). "Final Fantasy XIII Episode Zero -Promise- (Encounter) released". finalfantasy-xiii.net. Archived from the original on 2012-03-03. Retrieved 2010-06-25. ^ "Final Fantasy XIII　Episode Zero -Promise-" (in Japanese). Square Enix. Archived from the original on 2013-07-06. Retrieved 2010-07-19. ^ a b "小説FINAL FANTASYI・II・III　Memory of Heroes　公式ページ" (in Japanese). Square Enix. Archived from the original on 2016-03-04. Retrieved 2016-03-23. This page was last edited on 24 April 2019, at 16:37 (UTC).